In the Donna Darling collection was an absolutely gorgeous magazine image of Donna as a young woman. Sadly, the image was larger than the scrapbook it was in and was pasted across two pages and split in two. Also, a portion of the photo was lost. I’m not a photoshop expert, but I did the best I could with the photo, first I joined the two images as best as I could. Then I touched up some of the lines and creases. I tried to blend where the two images come together, but I wasn’t very successful with that. I’ve spent considerable time trying to find a copy of the New York Star, Volume XXV, No. 15, to no avail. 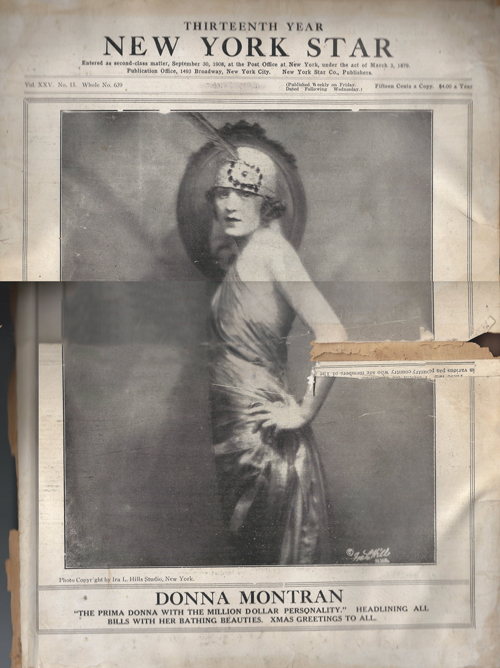 I have additionally contacted an archive that is holding many of the photographic images of Ira L. Hills in hopes they might have a high-quality image of Donna.